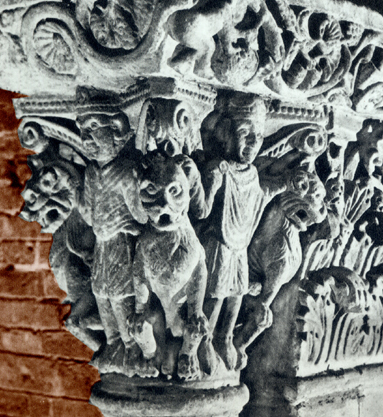 The Baboons guarding the front main door, St. Michael’s Basilica, Pavia. St. Michael’s ‘the major’ Basilica in Pavia, built in the Middle Ages (by the end of the 9th century to the mid-12th century), gathered two functions: it was the church where the kings of Italy were consacrated, and the sanctuary of the Archangel Michael, the patron of the kingdom and conveyor of souls to the sky ('psychopomp'). In medieval symbolism and mythology, the prerogatives of St. Michael, Prince of the Archangels, made of him the natural successor of the Egyptian god Thoth, the guardian of royalty and psychopomp, the transporter of the spirits of the warriors up to the heaven of eternal life. Thot (Theut, which is sometimes confused with Jehuti) was a lunar deity and was also the god of wisdom. He was the protector of the drawings, geometry, wisdom, medicine, music, astronomy, and magic, was the inventor of numbers, had created the hieroglyphic script and held ultimate control over mages. Thoth was also the god of laws. As a lawyer, supervisor and legal defender of the dead men, he took part in the weighing of the souls, the judgment to which the deceased was subjected, to see if he was worthy or not to enter the world of the afterlife. His totemic animals were the baboon and the ibis, the first because the Egyptians had noticed that it sits at dawn to watch the sun rise, and the second because it flies at sunset to the west. Then the two animals were considered 'companions' of the passage of the Sun and the Moon between the two worlds of the living and the afterlife. 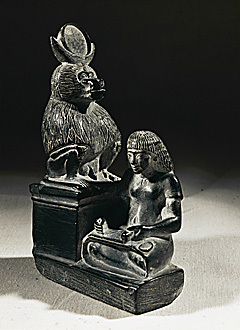 In the Book of the Dead of the Ancient Egypt the heart of the deceased was placed on a balance, on which sat a baboon. The animal had to report back to God when the balance was in perfect balance. In many temples of this God of the Moon the sacred baboons were accommodated. It was believed that the baboons were the spirits of the dawn, mutated as animals after having sung a hymn to the rising sun. An Egyptian scribe before the god Thoth, figured as a Baboon, 14 cm high stone statue, El Amarna. The tradition of Thoth was perpetuated over the centuries, attributed to Hermes Trismegistus by the Greeks and then by the Romans to Mercury, to match the cult of the Celtic Lugh and the Lombard Wotan and finally condense in the figure of the archangel Michael. The baboon was one of the totemic animals of that god, along with the bird ibis. The capitals of the church, built expressly to house the coronation ceremonies, showed different simian figures in dominant positions. Not surprisingly, just at the sides of the main portal of the church we see three baboons, in the role of "guardians of the door". 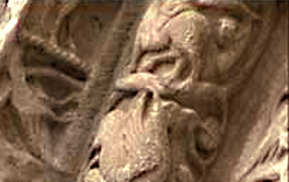 Not surprisingly, the median pillar of the nave, on the right, is surrounded, almost "wrapped" by baboons, in the corners of its capitals. 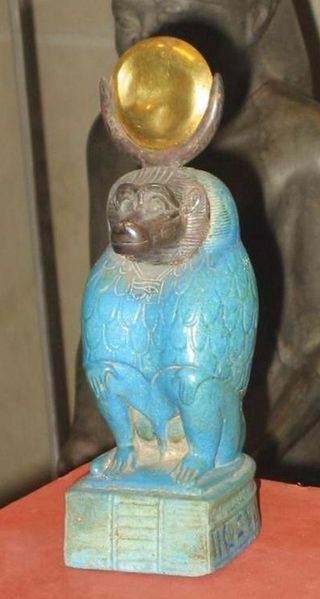 The god Thoth as a Baboon, stone statue, Louvre Museum. The thousand colors’ St Michaels Basilica, with its rich litostrati pavement and the fine polychrome reliefs, which decorated every corner of the building. Here kings were crowned, here took place the funeral of the powerful, for the old psychopompos will bring their souls to heaven: who cares if it was the Empyrean, Valhalla or Heaven? ... Is to be considered that this insistent repetition of the number 3 has its symbolic importance. Basilica di San Michele, Pavia. Another very mysterious figure, yet glimpsed in a crease of the right portal of the nave. 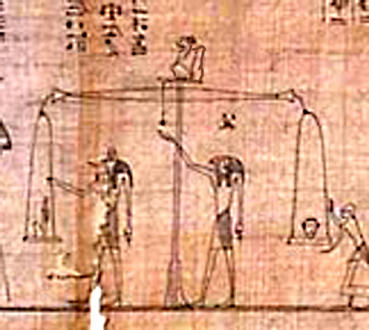 It's a naked man seen from the back, flanked by two demons, which are depicted as in the images of funeral of ancient Egypt, with long wings bent toward the ground. The two demons introduce their tongues in the ears of the man. This is the figure most 'abnormal' that can be observed in the weld of the portals. It is precisely the 'Portal of Passage', next to which St. Christopher was usually depicted, and this is an image of 'transition', with the two demons that perform the role of the greek Charon, ferryman of souls between the two worlds. The demons of the passage that lead man towards the other world, St; Michael’s Basilica, Pavia. The lions are never depicted as bipedal. 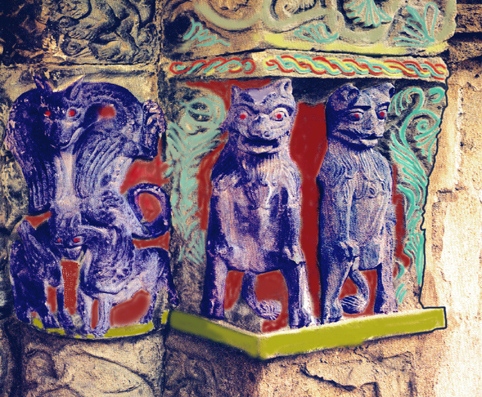 These erected animals, with long canines, guarding the mysterious shrine, in the south aisle of St. Michael’s, may only be three baboons. (from the ancient Egyptian Book of the Dead).